To understand the financial situation of a samurai during the Edo period, we first have to go into the contemporary salary, i.e., the form of his income, and the precise circumstances with which he was confronted. The following discussion is based on data for a samurai with the function and rank of hatamoto(旗本) the so-called „bannermen“, because it is for this group that the most detailed records exist. The adminstration of the Tokugawa bakufu consisted basically of three ranks of hereditary vassals to the Tokugawa family : the high-ranking fudai(普代), the above-mentioned hatamoto, and the group known as gokenin(御家人), the so-called „housemen“ of the shôgun. The fudaiwere strictly speaking daimyô (hence also the term fudai-daimyô,普代大名) who had been on the side of Tokugawa Ieyasu before the Battle of Sekigahara, and who therefore received strategically important fiefs as well as high political posts. The gokenin carried out most of the basic adminstrative functions of the bakufu and also formed the base of the standing army. The hatamoto ranked somewhere in between, depending on their income and the importance of their family origin, and held managerial posts and controlling functions. The above-mentioned real income, that is, what the samurai or hatamoto had at the end of the day, depended constantly on the prevailing price of rice. Essentially he received his basic salary in rice, whether through the grant of a fief or as a direct payment in rice from the bakufu. However, 50 years after the establishment of the Tokugawa bakufu, the government had already transferred the payments almost entirely into cash rather than rice, because in any case the recipient had to pay for the necessities of life in money rather than in rice. As a basis for payment in cash, the bakufu used its own conversion, termed the „posted price“ (harigami-nedan, 張紙値段) which differed from the actual market price. Those hatamoto who earned their income from a fief also had to exchange rice into cash at the „posted price“. Their profit or loss therefore depended strongly on the divergence of the posted from the market price of rice. *4 More money was used up in paying exchange fees to the rice brokers, the fudasashi(札差; literally „note exhanger“). All those factors contributed in the end to the bankruptcy of the samurai and the prosperity of the merchants. In earlier years, the harvested rice was stored in the storage houses of the fiefs (the kura, 蔵, 倉, or 庫) and transported to its final destination along the main roads. Because Japan´s roads were as everybody knows rather bad, it was, of course, impractical to transport huge amounts of rice all the time from A to B. Therefore, intermediate rice stores emerged along those main roads and soon, rice was transferred between those stores by paperwork. In cities like Ôsaka rice brokers (the aforementioned fudasashi) developed who offered to store rice temporarily in return for a certain amount of money. They issued papers to the samurai which noted the amount of rice which he had stored at the fudasashi´s. The rice brokers, on the other hand, made use of the old intermediate stores, and soon paper money-like notes circulated. The merchants accepted these notes from the samurai because they could be sure of re-changing them into rice at the broker´s. Basically it can be said that the problem of shortage of money because of the obligatory duties to the bakufu was rife among all classes of samurai. High-ranking hatamoto with an income of from 1.000 to 3.000 koku were the worst affected, because top earners had certain reserves, and, on the other hand, the duties of the lowest ranks could be neglected. This becomes clear from the records of a samurai of the Chôshû fief (長州) with a basic income of 100 koku. After subtracting the cost of rice for feeding his family and seven obligatory retainers, he was able to change the remaining 17 koku and 4 shô*5 of rice for 915 silver monme. *6 From this amount, 120 monme was used for the rent of his house in Hagi (萩, capital city of the Chôshû fief), 250 for a cook and a man, and the remaining 545 for food and clothes for a half year. If he could not cover the money for the other half through an officially approved second job, he had to borrow. A further example of a higher-paid hatamoto was the Master of Court Nagasawa Motochika. After taxes to the bakufu from his basic income of 1.960 koku and changing the rest of rice into cash, 483 ryô*7 remained. After spending this money for his obligatory duties he had to borrow a further 373 ryô to cover all the expenses of the first year of Shôtoku (正徳, 1711). The first real difficulties faced by the bakufu arose during the Kyôhô period (享保, 1716-1736). At the end of the 17th century, the coin reserves of the bakufu were running short, because the major gold and silver mines were exhausted. Added to that, there was a short period of abundance during the Genroku period (元禄, 1688-1704) caused by unusually high prices for rice, and steady prices for consumer goods. This was the administrative outcome of the preceding periods, and it left the hatamoto with a new taste for the finer things of life ; but with the same income. As a direct result, the government debased the gold coinage, to increase the amount of money in circulation. During the Edo period, the amount of gold, and later silver, coin was adjusted eight times by re-coinage. The first of those re-coinages fell within the Genroku period, in the year 1695. The gold content was lowered from 86% during the early Tokugawa era to 57%. To control the resulting inflation, the gold content was gradually raised at the next and next-but-one recoinages of the Shôtoku and Kyôhô periods in 1714 and 1716 to 84%, and later 86%. Only the fifth recoinage during the Genbun period (元文) in the year 1736 gave some stability to the currency in circulation, although precious metal was rated so highly that its export was strictly forbidden. The next problem of coinage and increased rice production in the course of the bakufu´s economic measures was the now dropping rice price. In order to increase the circulation of more coins, Tanuma Okitsugu (田沼意次1719-1788)*8 minted silver in the late 18th century. Initially this was circulated only as small lumps, calculated on the basis of their weight in monme (see also footnote 6, page 2). As we have seen, a hatamoto saw himself confronted with obligatory duties which he had to pay for out of his basic income, and which kept him on a short lead. A fundamental obligation and a mark of his very occupation was the Sword which he carried. I would now like to compare the prices of Swords at the time with the average income of a gokenin or lower ranking retainer of one of the fiefs (hanshi, 藩士), because here, the obligatory duties could be left out. This basic income was about 3 ryô plus a stipend of one fuchi. By the way of illustration, prices are given in terms of copper coins (mon,文). 1 ryô was equivalent to 4 coin strings (kan,貫), of which one counted 1.000 copper coins. Therefore the average income was about 12,000 copper coins per year so 1,000 per month. The Ôsaka-Shintô swordsmith Inoue Shinkai (井上真改) received 15 hakugin packs of silver coins (白銀)*9 for a long sword, which is 11 ¼ ryô. Again converted into mon, this make 45,000 copper coins – about four times the amount of an average hanshi´s annual basic income ! Tsuda Sukehiro (津田助広) received 7 ½ ryô, or 30,000 coins, and Kunisuke (国助), Yoshimichi (吉道), or Tadatsuna (忠綱) 5 ¼ ryô, ie., 21,000 coins. During the Shinshintô period, a blade by Suishinshi Masahide (水心子正秀) cost 7 ½ ryô and his pupil Taikei Naotane (大慶直胤) charged 5 ryô, 20,000 coins, but gave a 50% discount to customers from his own fief (he came originaly from Dewa, 出羽). By way of further illustration, I would like to quote some prices of daily life during the Edo period. An overnight stay with board at one of the hostels run by the bakufu cost 200 mon. A simple stay in a private inn ranged from 30 coins in very best cockroach-quality to 70~100 coins for so-to-speak starred hotels. One litre of sake cost about 15 to 20 coins, a river-crossing by ferry about 15 coins, new waraji straw-sandals 25 coins, a massage 50 coins, and a prostitute working in one of the above-mentioned inns from 500 to 600 coins – ie., equivalent to about the half of a monthly wage. Another example : in the fifth year of Genna (元和, 1619) Tamiya Heibei Shigemasa (田宮平兵衛重正), the founder of the Tamiya school of swordsmanship (Tamiya-ryû, 田宮流), ordered a blade by Hizen Tadayoshi (肥前忠吉) who charged the very high amount of 100 kan, so 100,000 copper coins. Thereupon Heibei resigned his post with the Ikeda family (池田) and had to change his employer two to three times. He ended up finally with the wealthy Owari-Tokugawa family. It took him fully four years to raise the sum for his blade ! As today, in ordering one could of course made compromises in the raw materials for a Sword (i.e. the amount of tamahagane for the blade construction), as well as in the polishing, or the mountings. But we can safely say that the vast majority of simple hanshi and gokenin wore off-the-peg kazuuchi-mono(数打ち物) and higher-paid hatamoto and daimyô orderd individual chûmon-uchi(注文打ち). Origami(折り紙) [ literally „folded oru; 折るpaper kami, 紙] were originally urgent notes written on one side of paper which was just folded twice. Later, this form of writing was used for informal letters and communications. 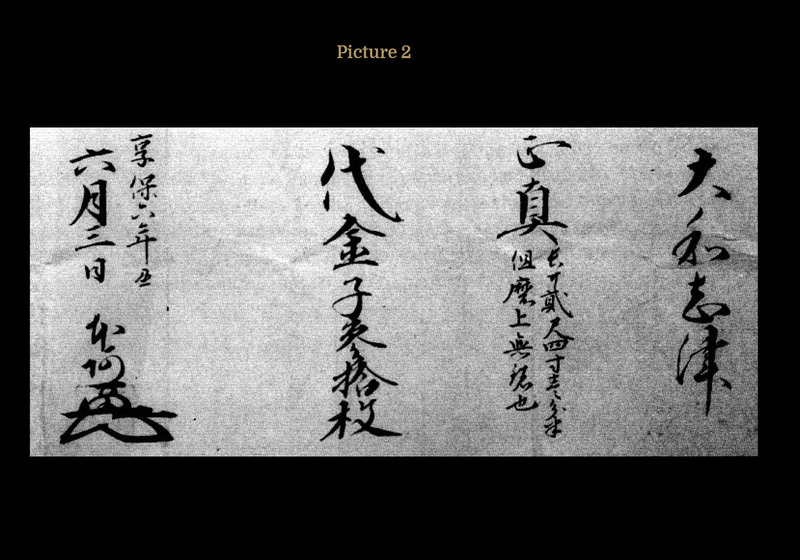 Because the Hon´ami as well as the Gotô families wrote their judgments, incorporating declarations of value (kantei-sho鑑定書, or kiwame, 極め), on such papers, the term „origami“ was applied to their documents. Already during the times of the Muromachi bakufu the Hon´ami family acted as Sword appraisers and polishers for the Ashikaga family, but any judgments or declarations of value which might be issued were rather un-standardized, and in addition were not restricted to the Hon´ami family. Only when Tokugawa Ieyasu created the „Centre for Sword Appraisal“ (tôken-kiwamedokoro刀剣極所) in the second year of Genna (1616) under the supervision of Kôtoku (光徳), of the ninth generation of the Hon´ami family, which was granted the monopoly to issue Sword appraisals. Generally, appraisals of the first 14 generations may be regarded as reliable ; whereas those of the 15th generation Kôjun (光純) fell into the time affected by the financial crises of Tanuma Okitsugu, and as a result his origami are also known as „Tanuma origami“ and have to be taken with a grain of salt. Appraisals from this time onwards drifted away from the original sense of declaring a specific value for a blade and were rather made with a focus on business factors. In general the issuing of origami was arranged as follows : every 8th, 9th, 10th, 14th, 17th, 20th, 24th and last day of the month, the heads of the several Hon´ami branch-families gathered in the mansion of the main family, which was the tôken-kiwamedokoro. Blades were brought and appraised and every third of a month, origami were issued under the supervision of the head of the Hon´ami main family. If there was disagreement over a blade, three further opportunities were given on the third day of the second, seventh, and eleventh month of the year for a re-submittal. This system continued unchanged until the Meiji period. On the origami of the Hon´ami family we find a declaration of value in the form of „dai-kinsuX-mai“ (代金子X 枚), which means „value, so and so much pieces of kinsu“, whereas one kinsu was equivalent to one ôban(大判). 1 ôban on the other hand was worth – according to inflation – 10 to 7 smaller koban(小判) which had the value of 1 ryô(16.5 g gold). For example an origami with the declaration of 20 kinsu gold-pieces means 200 in terms of ryô which is further 800.000 copper coins. If we call to mind, the average gross income of a hatamoto was about 500 to 1,000 koku, which makes net about 150 to 300 ryô. Hon´ami as well as Gotô origami had a standardized form ( picture 2 ) which stated on the right outside – at the beginning of the origami– the nominal attribution to a maker, followed by the confirmation of authenticity (shôshin, 正真). Under it came a short description of the blade, then the declaration of value, the date as well as the signature, and the kaô of the appraiser. 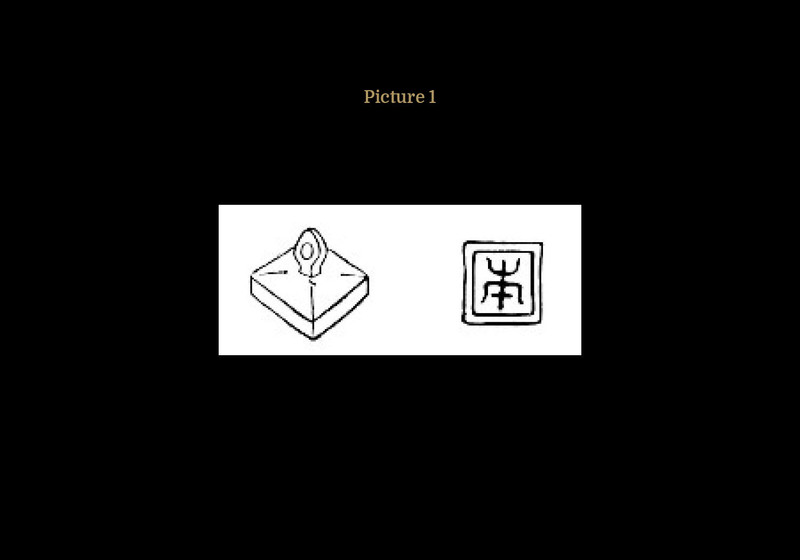 On the reverse of the origamiat the point where the kaô is located, an ink seal ( picture 1 ) was stamped with the character „Hon“ (本) for „Hon´ami“. The small brass seal which is still in the family was granted to them by Toyotomi Hideyoshi. The short description of the blade gave its length, horimono, if any, and the amount of shortening. In rare cases, we also find mention of a broken kissaki, the condition of the polishing, or that machi-okuri has been carried out. This means that when an origami-papered blade has a bôhi which is not mentioned in the papers, it can be reckoned 100% as an atobori (後彫り) which has been cut later on. *1One fuchiwas equivalent to 1.8 kokuof rice because the basis of this figure constituted the assumption that an average person needed five portions of rice per day. One rice portion was equivalent to one gô(合, 0,18 l = 1/10 koku), so 360 * 5 = 1.800 gô= 1.8 koku. *2We know from status records of direct vassals („Gokenin-bungen-chô“, 御家人分限帳) of the second year of Hôei (宝永, 1705) that at the beginning of the 18th century, about 5.000 samurai held the rank of hatamoto. Those documents reveal further that of those 5.000 hatamoto, over two thirds had an income of under 400 koku and only about 100 earned 5.000 koku or more. *3This was strictly regulated and depended on the basic income in koku. For example a hatamoto with 500 koku had 7 permanent non-samurai servants, 2 sword-men, 1 lancer, and 1 archer on standby. That means that when we incorporate the calculations of footnote 1, just 20 koku(1.8 koku* 11 men) were used up for their rations. *4The posted harigami-nedan was posted three times a year, and salaries were also paid three times a year. At first, the bakufu´s posted price was higher than the market price but the more the government was confronted with difficulties, the worse the conversion became, and the less the actual amount payed out to the recipient. *5 1 shô(升) is 1/10 koku, so 1.8 litres of rice. *61 monme(匁) is 3.75 g.
*71 ryô(両) was the unit for a gold piece of 16.5 g and further, 1 ryô was about equivalent to 1 koku of rice. 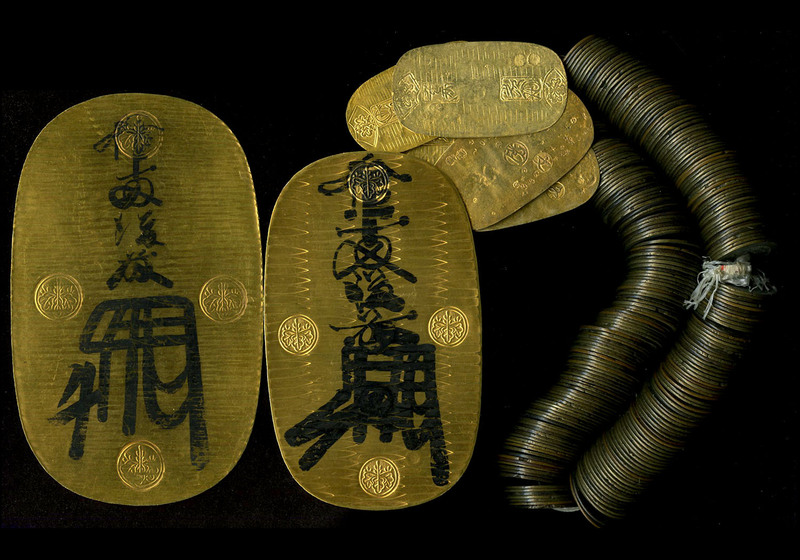 *9For larger transactions, gold or silver coins were integrated into sealed money packages (tsutsumi-kane, 包み金). Silver coins were packed with different sums but the standard was 3 bun(分) per 1 hakugin. 1 bunis ¼ ryô, so 1 „standard“ hakugin was equal to 0.75 ryô. In our case this makes 15 hakugin* 0.75 = 11.25 ryô. The background for this article may be found in Kozo Yamamura´s book „A Study of Samurai Income and Entrepreneurship“ (1974, Harvard University Press) ; and in an article by Sugiyama Kiyoshi (杉山清) printed in the Tôken Bijutsu No. 598 (November 2006).